Ice lanterns, also called ice luminaria, are a beautiful way to light up your winter night. Make one or two to accent a front door or make several to line a sidewalk. To make ice lanterns, all you need is a bucket, water, a small candle, and outside temperatures consistently well below freezing. 2) Fill the bucket about two-thirds to three-fourths full with water and place outside. 3) Set it outside to freeze. You'll need temperatures below about 25 degrees although lower temperatures are better. 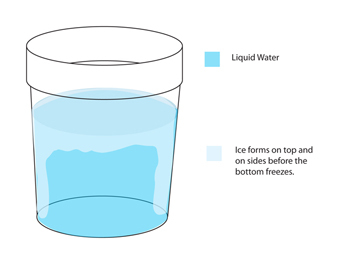 The top of the water, exposed to the air, freezes first and then the sides freeze. The lower the temperature the faster it will freeze. 4) Monitor the ice formation in the bucket. You'll want the ice on the sides to be about an inch thick. Don't let the water freeze solid or it is likely that your bucket will split. Depending on the temperature, it will take 6 to 18 hours to freeze. Allow plenty of time. 5) Bring the bucket inside. Turn it upside down in a large sink or tub. You can wait for the ice to fall from the bucket or speed things along by pouring warm water on the outside of the bucket. 6) Lift off the bucket. Pour out the water from the inside of the ice lantern out. If you're planning on making more than one, pour the cold water back into the bucket and then fill it to the same level again to start over. 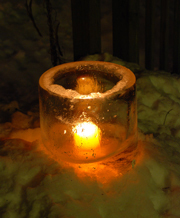 7) Place the ice lantern outside again to freeze any water in the lantern. This should take less than an hour but does depend on outside temperatures. 8) Place a votive or tea candle in the lantern. Light and enjoy! Helpful hint: Lanterns will last longer if you keep them out of direct sunlight during the day. Place the lantern in the shade to extend its life.